Please note – Please choose carefully as we don’t accept returns on sale items. This gorgeous white Wedding Dress features stunning pleats over the bust, spraying across the bodice front. It also pleats from centre back detailing the bodice and flowing out into an exquisite long train. It is strapless but with the pleating across the bust it softens the line. 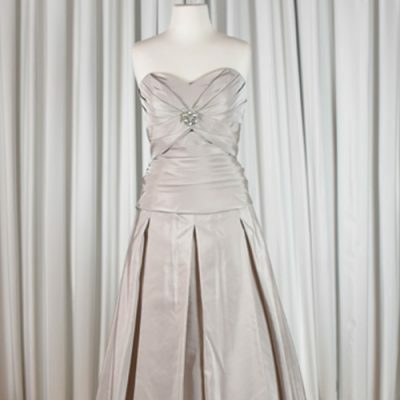 This bridal gown has a lace up back which is flattering on all figure types. This gown is brand new and an incredible bargain.